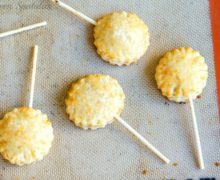 These Mini Apple Pies on a Stick are a fun bite-sized dessert! The crust has cheddar in it, which is a delicious savory compliment to the apples. Have you ever eaten a pie and thought, this could really use more crust? You know, I’m talking about those single crust pies…it’s totally not enough, and such a tease for the crust lover. If this is you, then today is your day! Despite seeing everyone’s Instagrams blow up with photos of berry pies during the July 4th holiday, all I have wanted since then is an apple pie. Don’t ask me why. I know apples tend to be associated with fall, but I always seem to get cravings for unseasonal recipes. In the wintertime, I’ll get a craving for ice cream. In the spring, I’ll get a craving for beef stew. And though it’s still summer, I want apple pie. Good thing Granny Smiths are available year round! 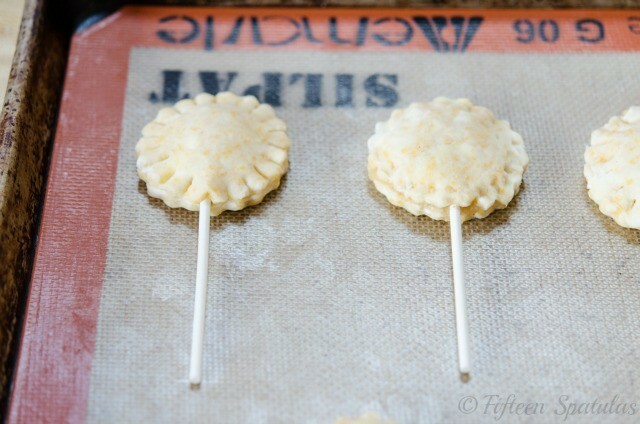 Regardless, whether you make these now or bookmark them for the fall, these pie pops are definitely worth making! But are you skeptical of this cheddar crust? It’s hard not to be skeptical if you’ve never tried it before, but now I can’t imagine eating apple pies without it. The crust doesn’t necessarily taste cheesy, if you know what I mean, but rather the sharp cheddar enhances everything else that is there. Apples and cheddar really have a strong affinity for each other, and it’s very apparent once you’ve had a cheddar crust apple pie. Since the crust only has five ingredients…flour, cheddar, butter, sugar, and water, please make sure to use a good quality cheddar cheese. My favorite is Cracker Barrel’s sharp cheddar (they won first place in the Medium Cheddar category at the US Championship Cheese Contest® with this cheese)! It has a really rich, full flavor that works really nicely in the crust. The food processor/bowl combo is one of my secrets for making amazing pie crust. 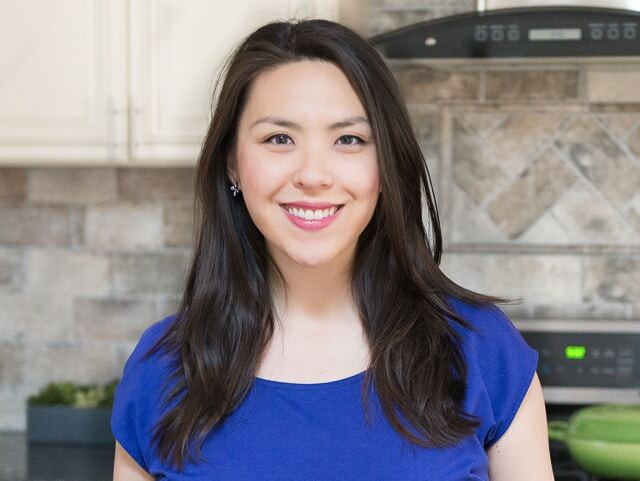 You want to use the food processor to quickly and efficiently cut the butter, but you want to add the liquid to the mixture in a bowl by drizzling it over and tossing everything around to moisten evenly. This lets the ingredients bind together nicely, with little gluten development. You’ll see what I mean if you watch my pie crust video. Form the cheddar pie crust into a disk and let it chill for at least one hour, and move on to the filling. Bake for 20 minutes and they’ll come out golden and beautiful! And that’s it! They’re ready to eat. P.S. If you’re not digging the pie pop thing, this would work as hand pies as well. Just cut the dough into squares, fill them, crimp, and bake. Enjoy! 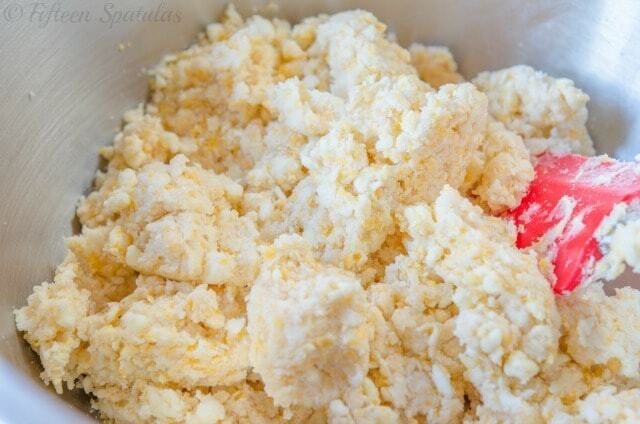 Start with the crust by combining the flour, cheese, and sugar in a food processor. Pulse a few times to combine the ingredients. Add the cold butter cubes and pulse about ten times to cut up the butter into small pea sized pieces. Dump the contents out into a very large bowl, and drizzle in the ice water while using a spatula to toss the ingredients around. You should see the ingredients start to form clumps as the water moistens the flour. Add more water if needed, 1 tbsp at a time, until there is no more loose flour particles in the bowl. Form the dough into a disk and chill for at least one hour. 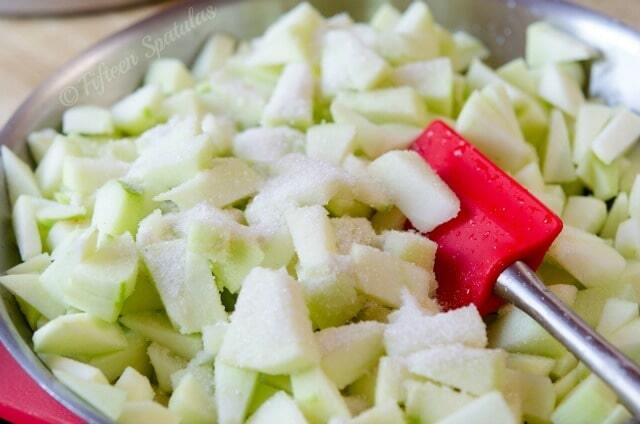 To make the apple pie filling, combine the apples, sugar, lemon juice, cinnamon, and lemon in a big skillet. 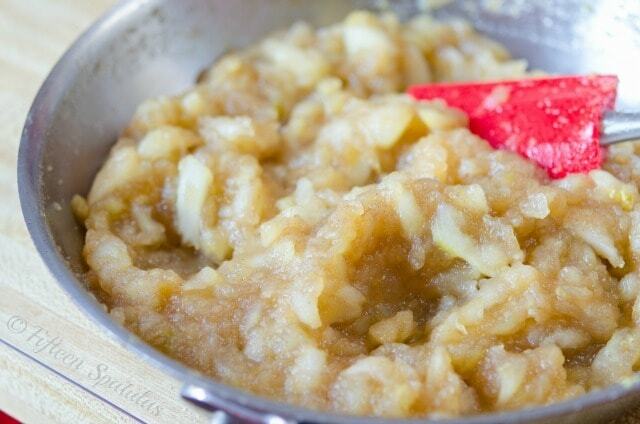 Cook on medium high for 10 minutes until the apples soften, then mash with a fork. Leave some chunks in there for a nice texture. Mix the rum and cornstarch together until the cornstarch has dissolved, and mix it into the apple mixture. Apple pie filling is done! Preheat the oven to 375 degrees F. On a lightly floured surface, roll out the cheddar pie dough to about 1/8 inch thick. 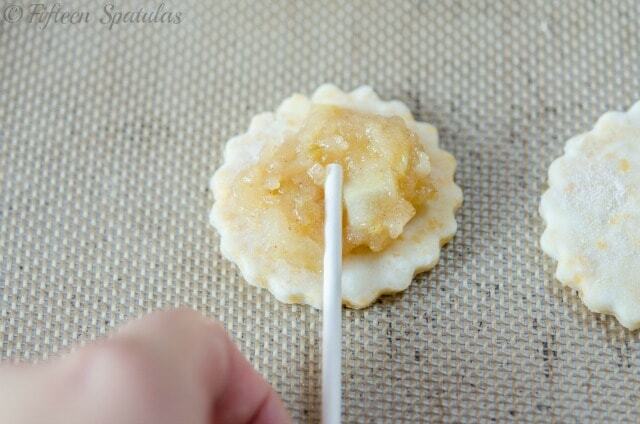 Cut circles out with a cutter, and place a spoonful of the apple pie filling and a lollipop stick on one circle, and cover it with another. Crimp with a fork of the lollipop stick to close well. 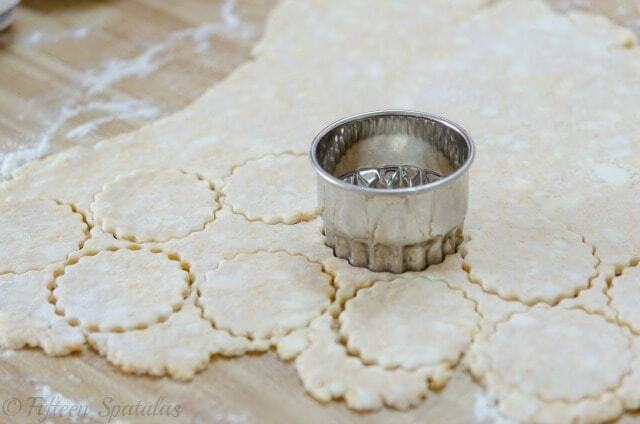 Place on a baking sheet and repeat with the remaining dough and filling. 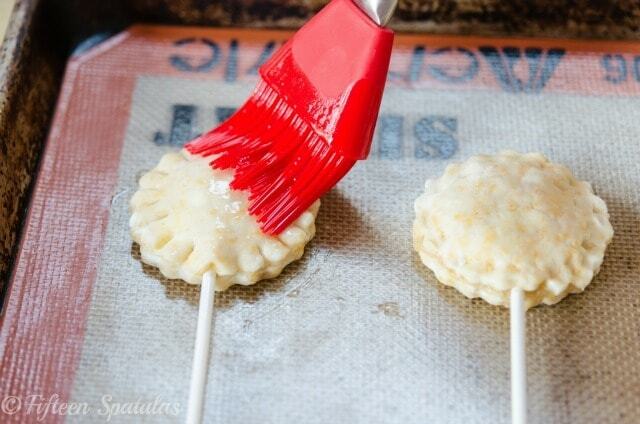 If you’d like, brush the pie pops with egg white or a whole egg for a glossy finish. 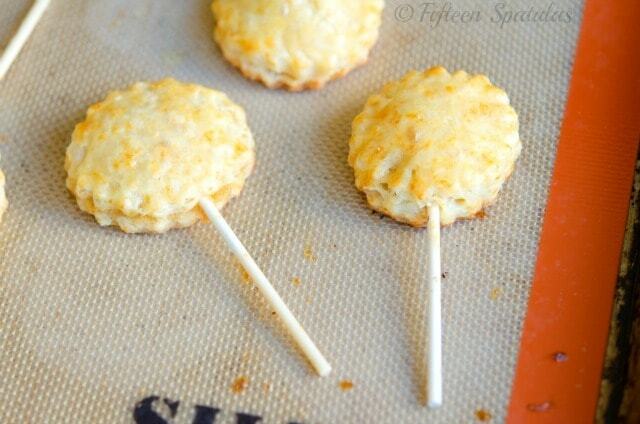 Bake the pie pops for about 20 minutes until lightly golden brown and puffed. Serve and enjoy! Who knew cheddar with apple pie could be so good?